This week in weird food news we learned about brain-infused beer, a monstrous bloody mary and a restaurant where people dine with the dead. Insanely Garnished Bloody Mary: The garnish is one of the most important components in a great bloody mary. Acceptable garnishes include celery, olives, pickles, carrot sticks—even a shrimp or two. But an entire chicken is going overboard. Vancouver’s Score on Davie is offering a $60 (US$ 53) bloody mary garnished with not only a roast chicken, but also a burger, a slider, chicken wings, onion rings, a hot dog topped with pulled pork and mac and cheese, a brownie and, in a nod to tradition, a pickle. Beer for Zombies: If the inevitable zombie apocalypse is taking too long to happen and you just can’t wait to become a decaying, brain-eating automaton, there’s a beer for you. Philadelphia-based Dock Street Brewery is releasing Dock Street Walker beer made with real, actual, once-were-used-for-thinking brains (goat brains to be precise). Also in the mix: cranberries, for that nice tang that brings out the brain flavor. 10,000-Calorie Burger: It’s almost as hard to wrap your mind around the Ulti-Meatum as it is to wrap your mouth around it. Sold at a restaurant called Mister Eaters in Lancashire, England, the massive sandwich is made up of a cheeseburger encased in another burger patty, which is topped with cheese and sandwiched between two complete cheeseburgers, which are each topped with lettuce and tomato. 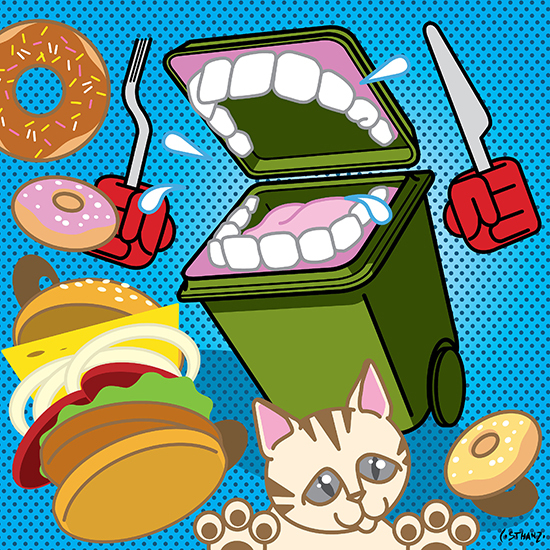 It was inspired by a cartoon burger seen in an episode of Cartoon Network’s Regular Show. Eat with the Dead: There is a restaurant in India that lets customers eat next to dead people. The New Lucky Restaurant (which isn’t actually new, it’s been around for decades) is scattered with occupied coffins. Indians believe that it is good luck to dine with the deceased. Scotland’s First Wine: Thanks to global warming, temperatures are now high enough in Scotland to grow grapes. The country’s first bottles, from a vineyard north of Edinburgh, will soon be on the market. The wines—two whites and a rosé—are made with Solaris, Rondo and Siegerrebe, three obscure grape varietals known to ripen early.